Seal of Haakon V of Norway (reigned 1299 - 1319). 1580 version, from the engraving of Bergen in the Civitates Orbis Terrarum by Hieronymus Scholeus, published c. 1580. During tha late middle ages, the axe was gradually lengthened. 1733 version, from a portal erected in Trondheim during the royal visit in 1733. The axe handle has the curved shape used during from c 1500 until 1844. 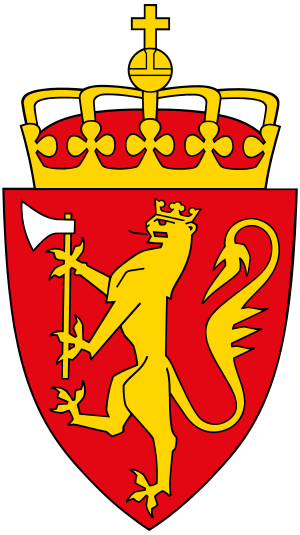 Norwegian coat of arms approved by royal resolution 10 July, 1844. The first authorized design of the arms. Coat of arms of Frederick IV of Denmark and Norway, as depicted in the Long Hall of Rosenborg Castle. The coat of arms of Norway sinister chief. Union and royal coat of arms of the Union between Sweden and Norway from 1844 to 1905. The full achievement in the royal flags of Norway and Sweden. Union coat of arms without the hermine mantling, but with the two crowns indicating two separate kingdoms. Illustration from book of plates depicting Oscarshall palace in Oslo. Published by Chr. Tønsberg 1852. Norwegian coat of arms adopted 1905, design by Eilif Peterssen. The royal family has used this version after the adoption by the government of a new version in 1937. Design of Norwegian coat of arms used by the Norwegian Telegraph Service, 1940s and 1950s. 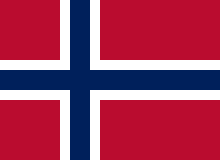 New design introduced in 1943 by the Quisling government during the German occupation of Norway. From a postage stamp issued in 1944. الصفحه دى اتعدلت اخر مره فى 23 يوليه 2013,‏ 08:41.